Giving A Whole New Meaning To "Stiff Drink"
I have a huge statue of Kermit the Frog occupying the corner of my desk. It has light-up fireflies behind Kermit and plays the Rainbow Connection. I love it. 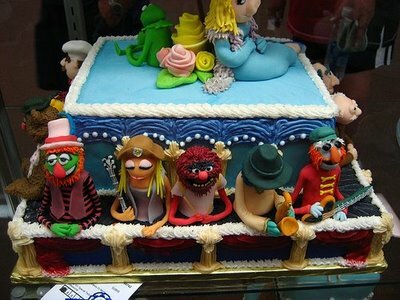 Yes, it's all the characters from the Muppet Show, modeled in fondant, on cake. The Electric Mayhem is looking mighty groovy. And I love Camilla the chicken. Say, have I mentioned that my hubby John does a fantastic Swedish Chef impersonation? Seriously. If you ever meet him, ask him to say "Bork bork bork" for you. It's downright uncanny. Of course a Muppet Show cake would never be complete without their in-house peanut gallery, Statler and Waldorf. Still, I'm guessing even those two curmudgeons wouldn't find a thing to complain about on this sweet creation. I don't have any info on baker Heather; I only know this cake won the blue ribbon at the 2007 Kentucky State Fair. If anyone has more info or a website for her, be sure to let me know. Also, there's a nice slide show of these and more photos here. Thanks to all of you readers who sent in the link! I love Beaker! Too awesome. This cake is amazing!! No wonder it won! I don't think I could ever eat it though! I love the Muppets and so do my kids. I think somehow the idea of taking a bite out of Kermit is wrong :| And I'd keep Animal...he's always been my favorite, hehe. Incredible. I wish I'd had this for my wedding cake 23 years ago! I love the muppets and I love this cake.She did such a great job on it.I hope you find out some more info on her.I would love to see some more cakes designed by her. She's even got the Professor and Beaker. 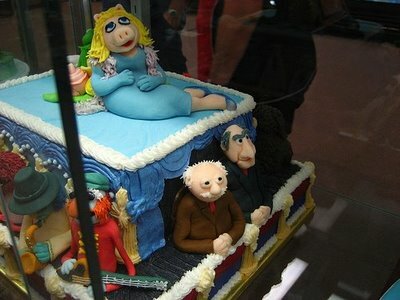 I love the Muppets; I love this cake. I still get sad when I about Jim Henson being gone. That thing is awesome! Great details. Her name is Heather Haynes and she is from Clarksville, Indiana. She won honorable mention in 2005 in Wilton's Cake Decorating contest with a cake called "A Mad Tea Party." From what I can tell, she has no web site or anything. This cake is fantastic. She did a terrific job. I'd be scared to eat it. This cake is great! :) We've been renting all of the Muppet Shows from Netflix...my nine-year-old loves them. I can't believe it's been so many years since they were on! That is the best cake I've ever seen. When Jim Henson died, my first thought was, "I wonder if Kermit is OK." Silly. I know. But that's how lifelike and endearing The Muppets are to me. This is quite impressive, I can't imagine eating it though. I'm with v. nicharico, isn't it wrong to bite off Kermit's head? Statler: You know, there's nothing like a good cake. Waldorf: Yeah, and this is nothing like a good cake. Both: Dwoah! Ho ho ho ho! I would admire the hell out of this cake, take many hundreds of photos, and then eat it with great enjoyment. Yes, MOI! 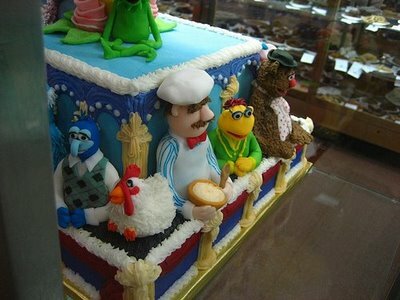 I love the cake - it's a piece of work (and I am from the muppet era so I'm LOVING it!). These cakes came out so good it's almost sad to think they have to be eaten. ZOMG!!! Professor Bunson Honeydew and Beaker!!! The Electric Mayhem!!! Gonzo!!! Camilla!!! Scooter!!! Sam the All-American Eagle!!! You know, when The Muppet Show was on the air, my family judged the relative coolness of celebreties by how they interacted with Muppets. My father's brain nearly imploded the night Alice Cooper was on. Here was this freaky guy wearing makeup and singing songs that creeped him entirely...but he was so great with Muppets he had to be cool...but he was a freak...but he was cool...it was amusing to watch. I'll never forget the one with Rudolph Nureyev, simply because he looked like he was having the time of his life dancing a spoof ballet (Swine Lake) and singing a duet with Miss Piggy. 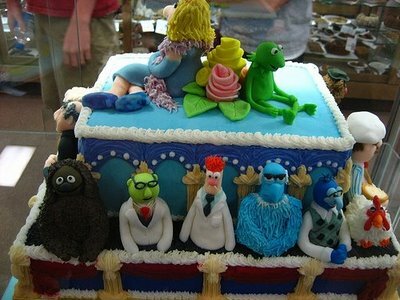 I'm with middle aged woman, this would be a wedding cake to stand up and cheer for...even if I would feel guilty eating Kermit. This is an incredible cake. I'd have to take all the fondant characters off, shellac them, and put them on a shelf. I couldn't eat them. Not only because they're the muppets, but because look at all the loving effort that went into making them? All that detail. Sam's feathers! Rolf's fur! Gonzo's argyle sweater! I sooooo want that cake!!!! This is WONDERFUL! Thanks for sharing non-wrecks. How is it that someone from Indiana enters the Kentucky State Fair? To recreate the characters so true to their form? Truly a gifted person! 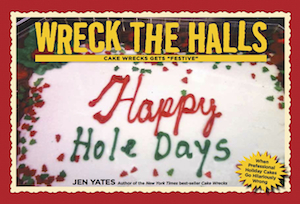 Jen, this is one of my all-time favorite cakes - I can't believe I didn't think to send this for a Sunday blog. You get extra props for posting this near Jim's birthday, too, which was this past Wednesday, 9/24. I'm huge fan of the Muppets. I entered my wedding reception to "Mahna Mahna" (wish we'd had this cake!). My car's license plate is MUPPET (and the car's name is Camilla). My blog is named in honor of the Swedish Chef. For all of these reasons, I tip my hat to you for honoring this cake. For anyone who's looking for some Muppety fun and news, I'd recommend checking out http://www.toughpigs.com! That cake is incredible! You've got to love the Muppets! Woohoo! I love it! Last year for Christmas, my Hubby got me season one of the Muppet Show. The whole family loves to sit down and watch it! Props to a fellow Hoosier! I'll have to show this to my kids. We just watched The Muppets Take Manhattan last night! I love the muppets! How cute! That is the best cake I have seen in a long time! I grew up watching that show and unsuccessfully tried to get my kids to watch it. They never got hooked, but I still am :) Awesome cake!! I was also amazed when I stumbled upon this at the 2007 state fair. I spent more time admiring this cake than I did anything else at the fair that day. And took lots of pictures, too. That is AWESOME! I'm seriously in awe. I've been renting the Muppet Show for my kids....good times. Wow! I think this is the best thing I have ever seen. I don't think I would be able to desecrate it by eating it. who has a tshirt "I appreciate the Muppets on a much deeper level than you"
September 28, 2008 | Nee S.
I LOVE the Muppet Show. As a child I never wanted the episode to end and as an adult I've bought the DVD sets. I'm just as excited to watch the shows as my children are! This cake is amazing!! If I could buy it, I'd find a way to perserve it forever!! Simply AWESOME! I would buy that cake in a heartbeat! Too bad it is almost too perfect to eat......almost. I think it is the most fabulous cake I've ever seen!!! She is awesome and the likenesses are FABU!!! Jim Henson would be so proud! That is a beautiful cake! I love it!! That is amazing! Wow that is amazing! I'd hate to cut it though it is too pretty to eat. Absolutely gorgeous!!! The only notable (IMO) missing is Rizzo the Rat. Surely Jim is up there somewhere smiling down on Heather for her faithful re-creation, and on you Jenn for spotlighting them this week. Be nice and don't swear.